We have been featured in various magazines, newspapers and TV features over the years. Click on the various articles and websites to see what they say about us. Tim Boyd and New Wave celebrated 25 years of business with a anniversary party. Customers, friends and family all came together to enjoy a barbecue luncheon cooked by Bob Parkinson of Made By Bob, Cirencester. Entertainment was provided by The Cosmic Sausages, Cirencester Band and Gloucestershire magician Richard Parsons. We were very honoured to be recognised recently at the Cotswold Life Food and Drink Awards with Tim Boyd receiving the Editors Choice Award. Please click on the link to read about the event. We recently had a seafood and oyster bar at the Chipping Norton food festival , organised by Wild Thyme restaurant. Raymond Blanc has New Wave as top in the UK ! See what The Times said about The New Wave Fish Shop this weekend. 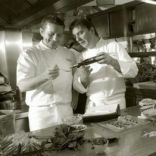 We are pleased to be listed as the fish supplier to Raymond Blanc and Gary Jones at Le Manoir. We have a unique and ongoing relationship with the hotel and share their passion for fresh sustainable seafood. Chef Sonya Kidney finds the best of a British autumn in cooking Salcombe crab supplied by the New Wave Fish Shop and making a delicious salad. 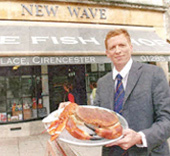 An ambitious seafood supremo who has put his heart and soul into running a fresh fresh business for 20 years has hooked his Cotswold customers. 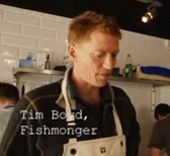 At a time when businesses are closing left, right and centre an enterprising duo has brought the taste of fresh seafood back to the Cotswolds after an absence of over a decade. 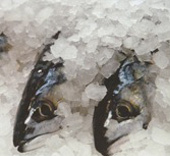 We are pleased to have New Wave the Fish Shop recommended by Gourmet Britain on their website. Click on the link to read what they say about us.